Vacation Barefoot Travel Blog: Take trip to a diamond field! Take trip to a diamond field! Back in February I blogged about how you can pan for gold while on a vacation with this post: Take a gold panning vacation. Now I'm gonna tell you about a place where you can hunt (and keep) diamonds! That's right, in Murfreesboro, Arkansas there's a little place called Crater of Diamonds State Park where you're allowed to hunt and keep diamonds. And about 300 to 600 diamonds are found per year by visitors. Crater of Diamonds State Park is the only diamond-producing site in the world where the public can search for diamonds. What you find is yours to keep. The park has camping and and on-site water park for those not seeking treasures. Adults get a day pass for $7 and kids get in for $4. At that point you can also choose to rent shovels, panning tools and buckets from the office (for about $8), or you can simply just kick around the dirt and look. Do people actually find diamonds? Yes! 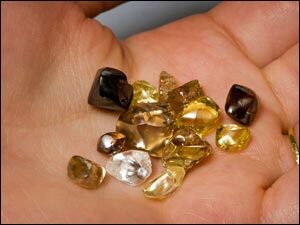 Check out this link to recent finds: www.craterofdiamondsstatepark.com/recentfinds, most finds are under a carat and in a lot of cases the diamonds are yellow or brown in color making them not too valuable. Just this year a man from Colorado found a white 8.66 carat diamond in these very fields. The professional treasure hunters at the park's visitors' center offer a free service to help determine if your find is a diamond or a dud.